In 2009, Tracen Sherfey was born with Hirschsprung's Disease (HD), which damages the large colon and the ability to defecate naturally. It is often noticed when an infant doesn't have a natural bowel movement within 48 hours of birth. Tracen died after three doses of Johnson & Johnson's Infants’ Tylenol, which was prescribed by the hospital's doctor as a remedy for Tracen's discomfort upon changing his newly installed colostomy bag. The medical solution is usually surgical, extracting wholly or partially the baby's colon and installing a colostomy bag. HD is explained as a developmental disorder “characterized by absence of ganglia in the distal colon, resulting in a functional obstruction” (Medscape). In other words, it's a malfunction of the fetus to develop into a normal human body. So Tracen's parents, Stacy and Neil Sherfey, were instructed to give Tracen a specific dose of Infants’ Tylenol upon changing Tracen's colostomy bag after his discharge from the hospital. The doses were given according to instructions and Tracen died from acute liver failure two days after being taken home and administered the prescribed dose three times. The FDA issued a warning cautioning doctors to not prescribe any drugs with more than 325 mg of acetaminophen. Tylenol contains acetaminophen, which can and does irritate the liver. As a matter of fact, over the counter (OTC) drugs containing acetaminophen cause more ER visits and deaths than any other OTC pharmaceutical. But this warning does not apply to OTC products like Tylenol. It's possible that the acetaminophen amounts can be higher at times due to manufacturing errors. There are painkillers that are prescribed with a combination of opioids and acetaminophen. Amazingly, the “standard of care” for vaccination adverse reactions involves using Tylenol to “reduce the fever and pain”. Great, just when the baby's immune system is under attack from toxic vaccine materials, add a known liver toxin to reduce symptoms. Ultimately a few different courts, after several hearings, wound up dismissing charges against the Tylenol contracted distributors. Apparently, the parents' lawsuit failed or it is being joined with other suits within class actions against Johnson & Johnson only for infants injured by their OTC drugs that do not have sufficient warnings. Only the prescribed drugs containing acetaminophen carry that warning. Seems like the FDA should be included in these class action suits against Johnson & Johnson as well for not including warnings of liver damage and failure from OTC acetaminophen drugs. Their acetaminophen warnings are not so accessible, and there seems to be a lack of enforcement. Yet ER visits from acetaminophen poisoning are among the highest, probably the highest. And not everyone survives or even makes it to the ER alive. How does 80,000 ER visits, 26,000 hospitalizations, and around 500 deaths annually sit with you? Enough to avoid using it, I hope. There’s much more about acetaminophen dangers in this earlier Real Farmacy article. But Tylenol and Motrin are not the only baby products that have Johnson & Johnson buried under an avalanche of class action lawsuits. There are several pending lawsuits against Johnson & Johnson for its talcum based powders such as Baby Powder and Shower-to-Shower. J&J knew about the ovarian cancer risk since at least 1982, according to legal documents. Those products contain the known carcinogenic dioxin, but J&J failed to warn women using these products. Now there's talk of including genitalia cancers of babies who have been powdered with J&J's carcinogenic talc. Additionally, Johnson & Johnson's anti-psychotic drug Risperdal came under fire when it was promoted as a treatment for dementia that's cheaper and more effective than generic drugs of the same type. This resulted in massive settlements from Johnson and Johnson with some different states and fines from the Justice Department totaling 2.3 billion dollars. In 2010, even Johnson & Johnson shareholders mounted a class action suit on their company for not doing what they should about cleaning up their act. The negative publicity was adversely affecting their stock holding values. Johnson & Johnson also makes Baby Shampoo, Oatmeal Baby Wash, Moisture Care Baby Wash, and Aveeno Baby Soothing Relief Creamy Wash. All contain 1,4-dioxine. Even the CDC says it is “probably carcinogenic to humans” and toxic to the central nervous system and brain, liver, and kidneys. 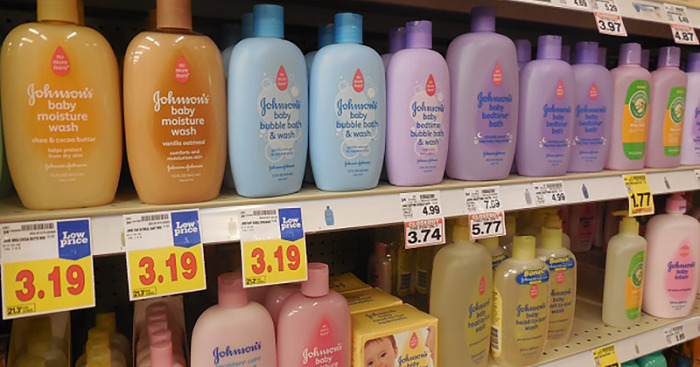 J&J Baby Shampoos use the chemical quaternium-15, which releases formaldehyde. It's a skin, eye, and respiratory irritant, and a known carcinogen (formaldehyde exposure has been associated with leukemia specifically). But formaldehyde in vaccines is safe to inject into babies. How inconsistent can the CDC and FDA be?! To be fair, picking on Johnson & Johnson is just the doorway to condemning our whole very unhealthy dangerous “healthcare” system. It's just that litigation can go there while vaccine damages lawsuits cannot. And after all, they put out lots of kiddie and baby products.